Navigate: Settings > Apps & notifications .. Tap the appropriate permission type to modify (e.g., Body Sensors, Microphone, Location, etc.). 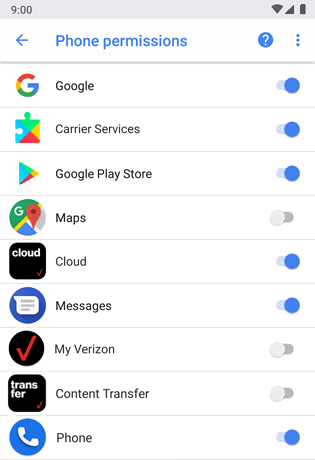 From the selected permission, tap any of the available apps (e.g., Google Play Services, My Verizon, etc.) to turn on or off . If turning off a permission, from the 'If you deny this permission...' prompt, select Cancel or Deny Anyway.